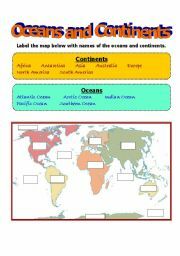 Label the World Map with names of the oceans and continents. 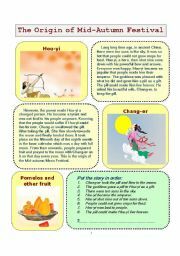 Two age-old Chinese legends in which students can learn something about Chinese tradition and culture. The stories are told in Simple Past tense. Comprehension exercises are provided. One of the stories of the famous King Solomon in simple past. Comprehension Questions are given in page 2 of the worksheet and suggested answers are provided. 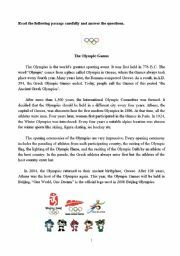 A brief description of the history of the Olympic Games. Comprehension questions including MC, T/F and Open end questions. Answers are given at the end. Reading and writing exercise. Reading exercise on a letter written to "Dear Abby" column. Answer key is given. Follow-up activity: Ss are asked to write a reply letter, giving advice to this shy and lonely girl. Expressions on how to give advice are provided to help Ss write the letter. 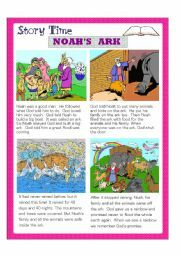 A famous bible story with some comprehension exercises on P.2. An answer key is provided at the end of the second page. 2010 is the year of the Tiger. 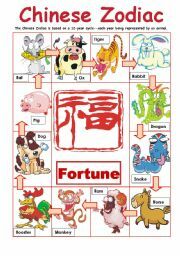 Learn about Chinese Zodiac and the 12-year cycle. An interesting way of learning similes. Students are asked to fill in the blanks with names of animals used in similes e.g. as strong as an ox while watching or listening to the song on youtube. 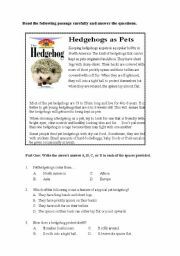 (The link is provided on the worksheet and pictures of the animals are given to help elementary learners of English to think of the answers. A reading comprehension exercise on one of the popular topics for youngsters who would like to court excitements. Suggested answers are given. 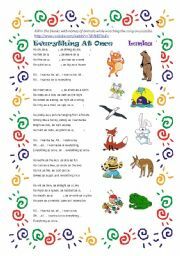 This is a reading comprehension exercise given to elementary or lower intermediate students. Suggested answers are provided on Page 2. 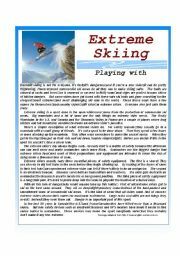 A 10-page introduction to school subjects. Ss talk about their favourite subject and explain why. Speaking and Pair Work drills. Note: The fonts used on P.2 may not be recognized by your pc. Please highlight the words that are illegible and change them to Arial or other more common fonts. A summary and revision on the Present Continuous. Explanation on when to drop the "e" or double the consonant before adding -ing is given. An exercise at the end serves as consolidation.